The Fr. Marcel Salinas Council #11536 is chartered to St. Timothy Catholic Community, Mesa, AZ. The Grand Knight for 2018-2019 is David Chapman and our Chaplain is Fr. John Greb, Parochial Vicar of St. Timothy Catholic Community. 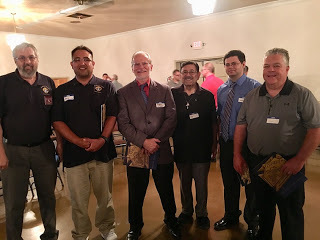 The Officers' Meeting starts at 6:00 pm and the Business Meeting starts at 7:00 pm on the second Wednesday of the month in the Spirituality center of St. Timothy's Catholic Community, 1730 W Guadalupe Rd., Mesa, AZ. Council #11536 services St. Timothy Catholic Church and its ministries, and the local community. Record your volunteer hours so we can accurately accrue and report them to Supreme. Volunteering is one component to earn our annual awards. Volunteer hours are now tracked on-line using a Google Form. All information is confidential, and all hours are rolled up by category without names. We do need your name to verify that a member of our council is submitting hours. Volunteering may include Faith (ushering, hospitality, EM, Religious Education, other church ministries), Community (Scouts, serving dinner at Paz, other civic organizations), Life (40 Days for Life, Baby Bottles,...) Family, and Fraternal (Pancake breakfast, dinners, other requests from church). Hours can be entered weekly, monthly, quarterly, or annually. Hours are rolled up and reported as part of the annual report due in June of each year. Council #11536 has set up a PayPal page were donations can be made to support Paz de Christo, and food bank and place where 150+ homeless are fed dinner seven days a week. Click here to donate. Any amount is appreciated. From left to right: Insurance agent David Lowe, Grand Knight David Chapman, Deputy Grand Knight Gerry Small, Chancellor Mike Coomer, Warden Tim Lyons, District Deputy Dcn. Bruce Bennett, Financial Secretary John Nekoranec, Advocate Mike Harrington, Recorder Paul Benner, Outside Guard Ryan De La Torres, State Secretary Mario Vassallo, Rev. Dan Vanyo, pastor St. Timothy Catholic Church. 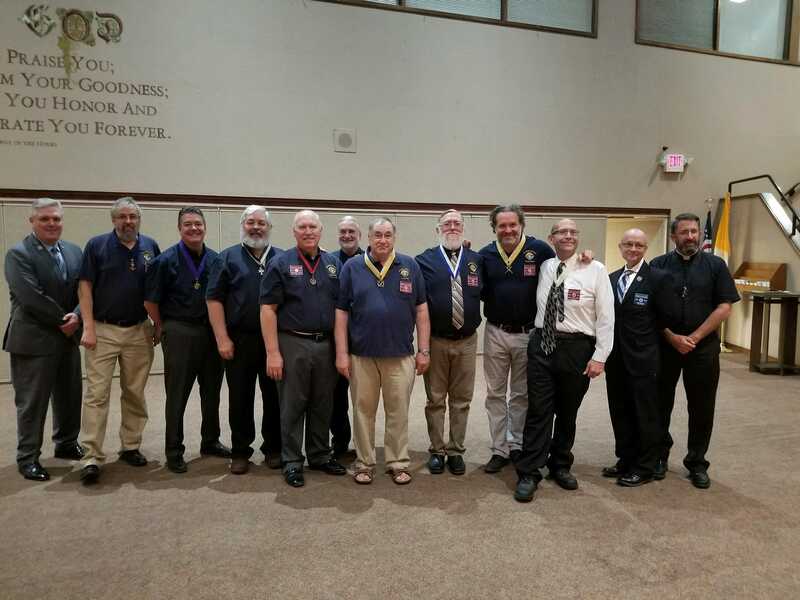 Congratulations to our newest second and third degree members!! From left to right: David Chapman GK, Jesus Anaya, Robert Szyka, Paul Raymond Estavillo, William Cutler and Bryan Jehling, who completed their degrees on July 22, 2018.